Jose Antonio Gonzalez Zarandona receives funding from the Department of Defence, Australian Government. Barely a week after ISIS beheaded Khaled al-Asaad, the Syrian expert who devoted his life to the study of Palmyra, the group is reported to have destroyed a nearly 2,000-year-old temple dedicated to Baalshamin, Semitic god of rain and fecundity. The reason seems clear: it is part of a plan by ISIS to get rid of the so-called idols, destroy the past and erase history, by targeting the heritage of Iraq and Syria. Following the destruction of the Bamiyan Buddhas in 2001 by the Taliban regime in Afghanistan, the unprecedented scale of heritage destruction currently undertaken by ISIS seeks to undermine the concept of heritage as professed by international organisations such as UNESCO, ICOMOS or ICCROM – that is, a Western concept very well grounded in our contemporary visual culture of the digital industrial age. With the destruction of the Palmyra temple, ISIS, as has been shown through previous cases of iconoclasm, is sending a very clear message: territories under ISIS control need to be radically transformed, so Year Zero of their Caliphate can commence, and that entails the destruction of idols. The question remains: what is an idol before the eyes of ISIS’ members? A straight answer is: everything that resembles the human form and that which is cherished by infidels in the West. And the best medium to spread this war of images is, of course, the internet. As the German curator Peter Weibel eloquently put it in the book Ravaged. Art and Culture in Times of Conflict (2014), the reason behind these images is to show that a war is taking place, so we do not forget it. But who is winning this war, one might ask. It seems whoever shows more violence. The ultimate reason to show these “spectacular” images of destruction is to assist ISIS in spreading fear and installing a permanent state of war in our minds. In this sense, one of the most horrific images that ISIS has recently circulated is that of the beheaded body of Khaled al-Asaad, a scholar who was killed because he was fulfilling his duty as a curator and archaeologist. By preserving the past, archaeologists working in extreme conditions in territories controlled by ISIS are taking the role of curator in its truest sense. The cultural cleansing that is currently taking place in Syria, demonstrates more than ever that the study of history, art and antiquity is a high-risk profession. Iconoclasm, as we all know, means the breaking of images. In the 8th and 9th centuries the word was used in Byzantium in reference to the removal and destruction of icons: sacred images depicting Christian divinities. During the Catholic Reformation in Switzerland, Germany and England during the 16th century, it was used to describe the destruction and fury that characterised the Protestants who pulled down from Christian churches the artefacts they considered blasphemous and caused idolatry. Iconoclasts claimed that objects made of stone and wood could not represent the true essence of the divine, and they dulled the senses. Iconoclasm and idolatry are two words that have been regularly used by the media and ISIS respectively, in reference to the destruction of cultural heritage in Iraq and Syria. As a result, the value of cultural heritage in these two countries has dramatically increased due to the threat that ISIS represents. Otherwise, how can we explain that in 2012 Iraqi forces were deployed to Syria, in order to protect the revered Sayyida Zainab mosque outside Damascus? The reason given was to avoid sectarian violence between Shia and Sunni, as was the case in 2006 when the Samarra gold-dome mosque that contains the remains of two Shia Imams was targeted by Al-Qaeda, sinking Iraq into a civil war that lasted for two years. And many of us will remember that in February 2015 Turkish soldiers crossed over to Syria to save the tomb of Suleyman Shah, the founding patriarch of the Ottoman Empire, in order to prevent their destruction by ISIS. We may try to understand ISIS’ iconoclasm of cultural heritage as a replica of former models of ethnic cleansing and purification as those described in Byzantium and Northern Europe. One of the main differences between previous iconoclastic waves and our age is the figure of the curator. 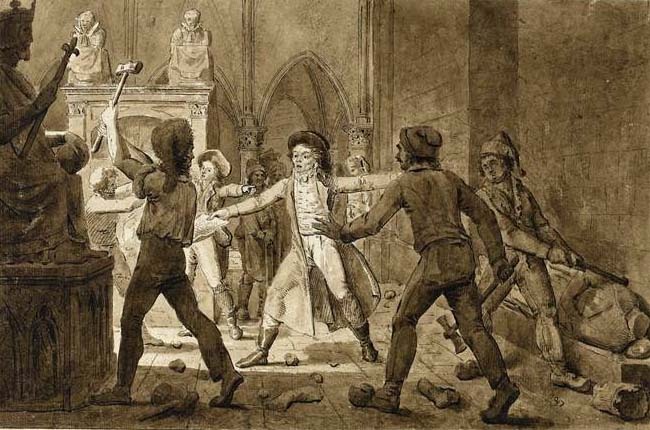 Think about the French archaeologist Alexandre Lenoir, who defended the monuments in 1793 at the Abbey of St Denis, when revolutionary forces stormed into the abbey and destroyed the tombs of French royalty. Nowadays, we are faced with the figure of the archaeologist who is not only an expert on antiquity, but who is also a cultural expert and a manager in preserving the past. According to the Oxford English Dictionary, curator (from the Latin curator) has different meanings, but it originally meant “one who has the care or charge of a person or thing”. In the case of Khaled al-Asaad, his role as an archaeologist entailed the study of the ancient city of Palmyra, occupied at different points of time by several cultures, regardless of who the owner of this heritage site was. It is no secret that in some countries, the post of archaeologist carries a lot of political capital, and this translates into the power of consolidating knowledge, but also to control it, such as Zawi Hawass in Egypt or Eduardo Matos in Mexico. In his role at the service of the State (the Baath Party), al-Asaad fulfilled the role of archaeologist, rather than that of a curator. Nonetheless, when ISIS captured the city he had tirelessly studied and took him hostage, al-Asaad was tortured and questioned about antiquities that he hid – a measure that prevented ISIS from looting and profiting as it had done with other artefacts. In their ridiculous attempt to justify his death, ISIS accused al-Asaad of being an apostate, because he talked at “infidel conferences” and as a government employee, he served as “the director of idolatry”. Working in extremely difficult conditions, al-Asaad took care of the city he loved. In charge of Palmyra, al-Asaad took his role of curator seriously until the end. Another definition of the word curator describes it as someone “who has the cure of souls”. This is important to bear in mind in light of the tragic death of Khalid al-Asaad, who was beheaded by ISIS, his body hanged from a pole and a photograph taken to certify his death. As someone with the ability to cure souls, al-Asaad tried to prevent the destruction of heritage, because he was convinced of the power of heritage to heal souls which are tormented by idols. Ancient artefacts in the Archaeological Museum in Mosul in northern Iraq have been destroyed by ISIS. Screen shot via YouTube.